Tech world has seen a lot of changes in the past years. With smartphones being released on a frequent basis, every company strives to add features that provide users a whole new experience. Amongst all the features, the one that matters the most to users wants is the display. The better the display of the smartphone, the better the phone is. Displays have been a major component for gaming enthusiasts and a high-end display has always been a need. The most preferred display for gamers in today’s date is 120Hz which is already present as far as gaming monitors are concerned. However, until now it was not present in smartphones. With the release of Razer phone and iPad Pro, 120Hz displays have finally been introduced in the smartphone arena. You must be wondering what’s this figure 120Hz all about, I am sure for a first timer it will sound new as smartphone users are only aware of 60Hz displays. Before understanding the difference between 120Hz and 60Hz displays let’s first understand what is refresh rate. The number of times the display of your screen refreshes in a second is defined as refresh rate. This means higher the refresh rate, better will be the quality of display. As the number says, 60Hz means a refresh rate of 60 frames per second. This refresh rate had been common as far as smartphones are considered. However, with gaming desktops a preferred refresh rate is 120Hz, which means the refresh rate is twice as fast as the one with a 60Hz value. The result is super smooth and clear visuals along with enhanced dynamic performance. A major advantage of using 120Hz lies in its ability to display video in 24Hz Blu-ray. Playing 24Hz Blu-ray content makes the display free from any kind of stutter and noise. However, it is not possible to play 24Hz Blu-ray content with 60Hz and hence the display has to suffer a lot of judder and noise. 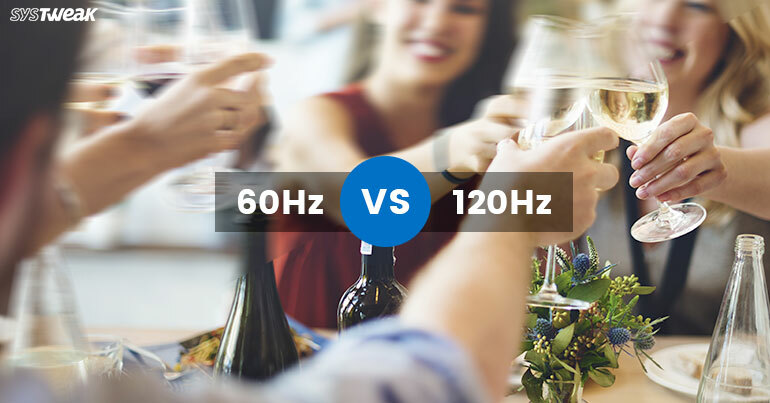 Though there is a major difference between both 60Hz and 120Hz, the result majorly varies in accordance with the type of source being used. With sources using 60fps (frames per second) to play content, using 60Hz or 120Hz display doesn’t make any difference. However, when sources play 120fps content, using 120Hz refresh rate makes a considerable change. On the other hand, playing content at 60Hz means a drop in frame number and hence the display quality is compromised. Seeing the difference between both the display refresh rates it is pretty evident that if users want to have a quality display both source and refresh rates should be high i.e. 120Hz. Thanks to the new smartphones, it is now possible for gamers to enjoy an all new gaming experience. 5 Inventions We Need Right Now!